Almost of climbers use “Trekking Poles”. Perhaps you can see climbers walking with 2 poles, because poles are for keeping balance. Do you know how to keep balance using the trekking poles. 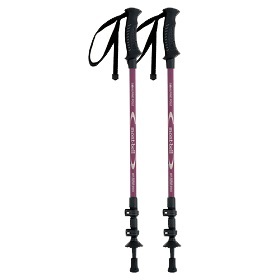 The tips of trekking poles can be broadly classified into the 3 types. We are writing the each tips below. them. How to set the length of poles? To unlock the lower part of locking mechanisms. To extend the lower part of locking mechanisms by maximum length of it. And lock it. To unlock the upper part of locking mechanisms. To extend the upper part of locking mechanisms what makes 90 degrees on your arm in your standing position. And lock it. The length is the best for walking on flatland or moderate incline. And the trekking poles has the grip with the band. Your hand through the band, and you can walk to let go your hand from the poles. When you use the trekking poles on the steep slope, you have to set the pole length before to use them. How to set the length of poles? To take off the hand from band. To grip the rubber part of the poles is shorter than using the poles on a flatland or moderate incline. The length is the best for walking on steep slope. Please don’t through the band your hand, or you will get injured in a fall. When you use the trekking poles on the going down way, you have to set the pole length before to use them. How to set the length of poles? To take off hand from band. When you grip your trekking pole, your palm set on the upper part of the rubber of your trekking pole. The poles are against the force such as going down from the summit to the ground on Mt.Fuji. Thereby can prevent knee pain. It will begin to open the climbing routes on Mt.Fuji. Have you been to ready to climb Mt.Fuji? You have to bring some gears that are important to climb Mt.Fuji. For example, climbing sack, rain wear and rain pants, and etc.